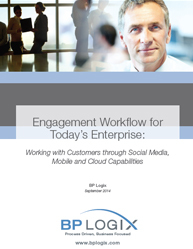 Customer engagement workflow through social media, mobile and cloud capabilities have become the most important need for today’s enterprises as social tools and cloud-based availability are among the best ways that companies can deliver value and leverage existing technology investment for successful customer engagement. With enhanced mobile support, social media integration, new cloud capabilities, and multimedia annotation businesses make their internal processes more efficient while also increasing communication with customers who are engaged in their business processes. Customers today demand both round-the-clock access to company representatives and swift resolution to their problems. Engaging your customer efficiently, will help you gain exposure, increase customer satisfaction and ultimately improve retention rates. Download this white paper now to learn how you can change the way your organization operates, enabling it to be more efficient, agile and effective with proper customer engagement workflow. This whitepaper provides deep insight on three elements, which enterprises need to provide in order to practice what we call, “customer engagement workflow” : Engage the customer by proper communication and acknowledgement. Embrace the customer by participating him directly in your business processes. Extend the cloud by integrating popular cloud services to your workplace. Generating more leads and building greater brand recognition can't be achieved without implementing the right digital marketing strategies. The best way to generate leads online is by implementing the right digital marketing strategies. But there are numerous different tactics and tools in digital marketing including social media and Email Marketing which companies are using for generating more business leads online. So how would you figure out which one fits best for your organization’s need? It is crucial to understand the role that each tool plays and how it fits into your brand’s overall marketing strategy. Best link building startegies you can put to work to build your business . Social Media Marketing Digital Media Marketing, etc Email Marketing YouTube Marketing Content Marketing Advertising How often do you track the users' behavior on the website and their location? Read this white paper talks about the marketing strategies which are helpful for generating leads and build brand awareness for your business. With digital workplace, it has become easy for enterprises to leverage a variety of technologies to increase productivity in their organization. If you need to communicate with stakeholders for better employee engagement, higher level of collaboration, and faster decision making process, you must have to leverage the new visual business aspects. So would you like to leverage visual content which connects people, ideas and aspirations? This whitepaper on '' digital workplace'' covers the following points: The Power of Visual Communications Hub and Spoke Approach A New Type of Information Delivery The Power of Connection It also addresses the following questions: Why you need a digital workplace strategy? What is the “Digital Workplace”? 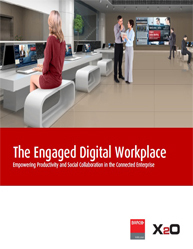 How does the digital workplace improve employee engagement? What are the changes we’re seeing in the workplace today?